Khaki pants and a white shirt – classic. The highwaisted pants are great in themselves – does anyone now where they are from? Molto Milanese! The colors, the classic pieces, the exotic leather…It looks easy and relaxed. Yet elegant! perfect in every detail–I wish I could see her shoes! Perfect. Those trousers and that belt – perfection. I love Lauren Huttons style she's one of MY style icons…This Screams that classic look of hers!!! I love this effortlessly cool outfit – very classic and chic. This is a chic and comfortable look – love it! Wonderful photograph – caught my eye instantly. Possibly one of the best I've seen on your site – and I look here often! The converging perspective blurred out and the woman so crisp and clear, just like her style… I love it! I agree that the clothes fit well and are classic. But this look has it's incarnations in every decade and I just don't find it noteworthy. If you have quality pieces some of them are bound to find their way to one another…. well put together – very chic! Love her clubmasters.. really classicly timeless. Note also her carefree hair – wash and go. her look is just so Easy , elegant, timeless and classic. Good spot, Sart. 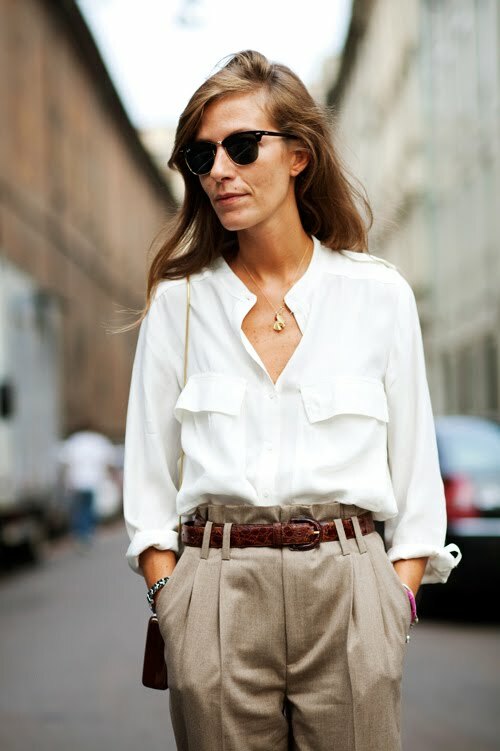 normally pleated pants are hideous, but she knows how to pair them with a shirt that flows just so… gorgeous.